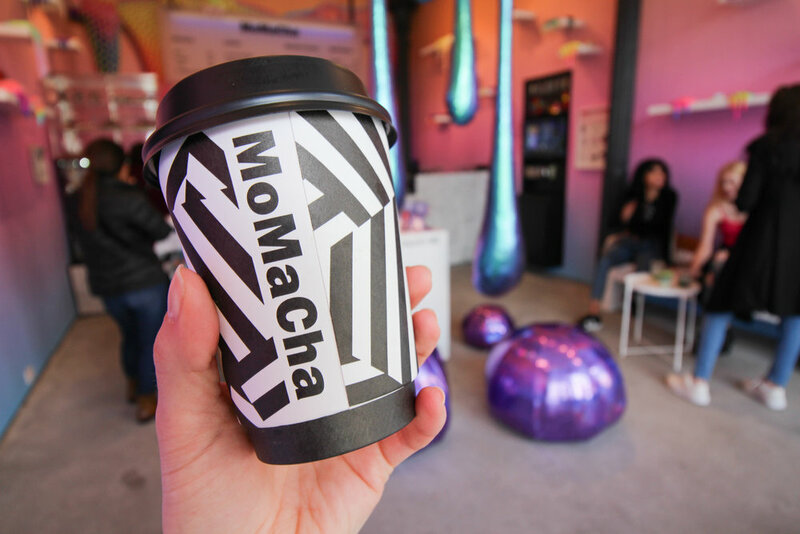 I've been trying to get to MoMaCha since Nev Schulman (yeah, the MTV Catfish guy) opened the unique half matcha shop/half art installation at the end of March. 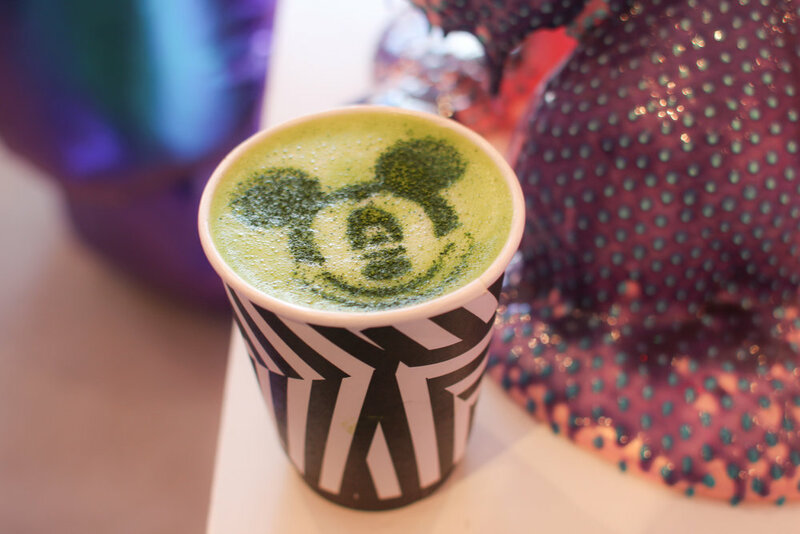 My urge to visit only increased when they announced they'd be serving up CBD infused Matcha Lattes for 4/20. My adventures took me everywhere except MoMaCha on 4/20, and I thought I'd missed my chance to test out the infusion. 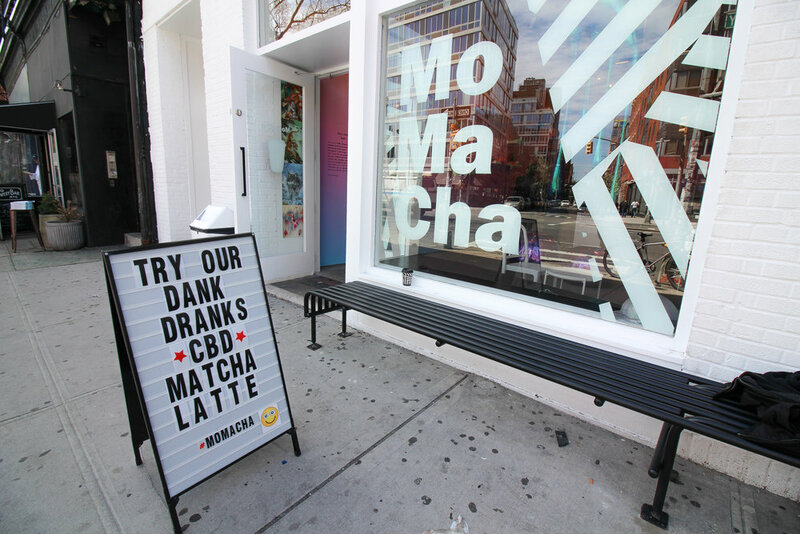 Apparently I'm not the only one who loved the idea of a CBD drink so the masterminds at MoMaCha added it to the permanent menu. I've never seen a cafe quite like MoMaCha before. The walls are coated with an orange to pink to indigo ombre hue that brings to mind sunsets over somewhere much more tropical than Lower Manhattan. Floating shelves display the art of Dan Lam. The multicolored dripping and oozing spiked sculptures will send you into a tactile tailspin, but as a sign reads, "No f*ckin' touchy". There is at least one sculpture you can put your paws all over though, and you'll want to, because it looks like a squishy scoop of millennial pink ice cream with spiked sprinkles. I was visually stimulated walking into MoMaCha for the first time, so 10 points to Gryffindor for the art installation piece of MoMaCha's mission. Now for the main event: CBD Infused Matcha Lattes. CBD is my favorite magic potion. More scientifically, Cannabidiol (CBD for short) is one of the naturally occurring compounds in cannabis. Yes, like marijuana. It's not! CBD is non-psychoactive and it is legal in all 50 states. You don't need a medical marijuana card to purchase CBD for yourself and you definitely don't need a special license to enjoy a CBD latte. Sure, there are some grey areas, as opponents of CBD point to the trace amounts of THC in some CBD products, but it remains legal. Will a CBD latte get me high? Nah, it's not like that. Non-psychoactive means you won't get that high feeling that maybe you've heard about but definitely have never experienced because you totally don't smoke pot, dude. So what's the benefit of CBD? It's a natural anti-inflammatory, anti-anxiety, and pain relief treatment. Research sponsored by the US government has shown it's potential to treat severe seizures, arthritis, PTSD, schizophrenia, depression, and more. It's totally natural and our bodies are perfectly engineered for CBD supplements. Without getting too sticky in the science of it, our bodies have an Endocannabinoid system (ECS). Cannabinoids bind to receptors in our ECS system. In a healthy, well-functioning human body, we naturally produce our own cannabinoids. A healthy diet and regular exercise keep the system functioning properly. But the key fact here is that many diseases are attributed to changes in the ECS. While it is still under research, it is generally believed that supplementing the body with external CBD can treat diseases associated with a damaged or dysfunctional ECS. I could fangirl forever about CBD and how it's has been a life changer for my anxiety. Not to mention, I used to down a few Ibuprofen every time I had a headache or any kind of pain. Now, my CBD oil is my first and only treatment. I'd never had matcha before so my experience at MoMaCha was doubly exciting. I ordered up a hot CBD infused matcha latte with a unicorn fruity pebble macaron on the side. 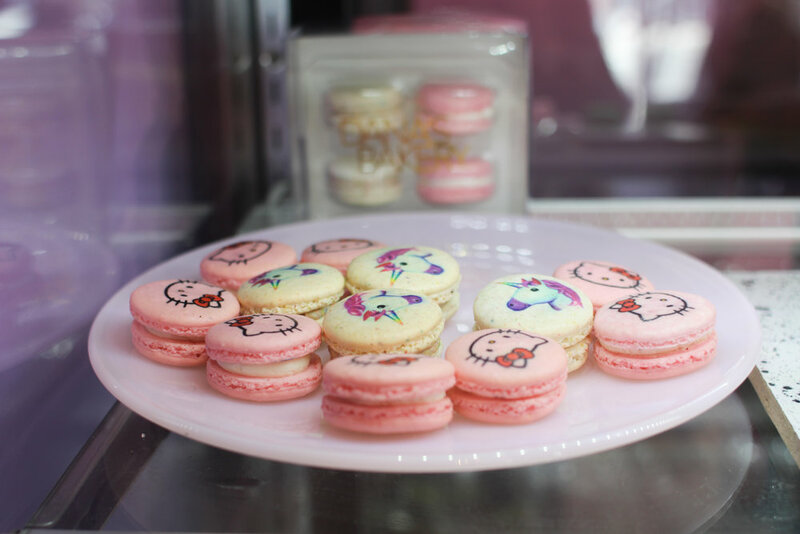 For extra CBD fun-time-happiness, you can add a CBD infused macaron with the ever appropriate cannabis leaf stamped on top. I had nothing to compare my matcha latte to but I really enjoyed the flavor. The matcha was earthy but smooth and rich. It was prepared with hemp milk keeping with the green theme, so I was extra pleased with that dairy-free feature. If you're not totally on board with the CBD idea, the MoMaCha menu has plenty of other unique potions to try like Blue Algae, Charcoal, and Tumeric Ginger lattes. They're all equally Instagrammable, by the way. The shop is a popular hangout for influencers and food bloggers so no one will give you side-eye if you take several photos before your first sip. MoMaCha is worth seeking out for it's unique menu and curious decor. According to the artist's Instagram, the exhibit is up until mid-July. I'll definitely return to see how the space changes with a new exhibit rolling in.